"There are plenty of $400 magicians out there who are only worth $75 and there are plenty of $75 magicians out there that should charge $400." That is a harsh, cold but very true fact. They all have the skills and potential. Still some do not take their performances up to the levels they should. The ending result is an audience that only gets parts of their show. The cheap $400 magicians shut out part of their audience. They do not allow the entire audience to listen to what they say. And they have serious timing problems. They do not allow the audience to absorb the actions being performed. The high valued $75 magicians take the time to address these common problems. Their entertainment factors are much higher. They do the things needed to keep the audience tuned into their performances. The materials presented in this book are not new. I did not go out to my back yard and dig them up. They are actively taught in school drama departments, and many other forms of public speaking/acting education. To my knowledge, as of this writing, I am the only person sharing this material with the magic industry. Working in front of live audiences requires a keen awareness of projection, block-ing, stage presence and timing. These factors hold true if you are doing a small party for five or six children, or a large show on a stage for hundreds of people. 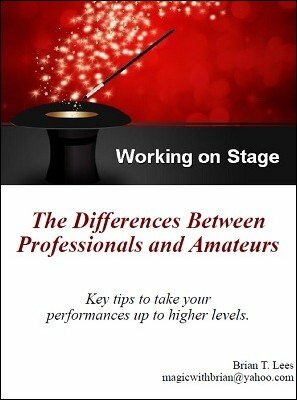 With this book I will address some of those areas and offer recommendations to work through them. The impact will be the audience's entertainment factor. Which, in turn, identify you as a higher level professional.